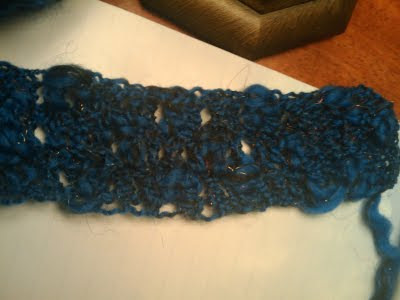 And here is the beginning of my blue shawl. I have experimented with shells, granny triangles, treble crochets, combining it with black sport yarn... You don't know how many years I've had this yarn, and been trying to find SOMEway to use it, it is so pretty and I like it so much. And it's funny that I end up using the "common" double crochet, just a simple double crochet, nothing else, and it's the best use of my yarn. I did consider the spider shawl (or whatever it's called) but I don't know that I have enough yarn to make it as long as I would like it. Well, it's probably not enough yarn anyway, but I'll give it a try, and hopefully, it will be ready for my trip to New York. Well, you know, provided that I decide that a large metal hollow object, commonly known as "airplane" (although I refer to it as scaricus airplanae) will not drop out of the sky and actually board one. New York might as well be a million miles away. It looks greenish here, but that's just the light. It's a brilliant blue, and me, I'm impatient and can't wait for tomorrow to post! Thanks for looking. Love the colour, it's my favorite Enid.